While the left side of my brain wasn’t looking, I became a knitter. Other crafty ventures have been flirting with me as well, so I’ve created a space here to indulge. I’d love some company – come on in. Howdy, doody – the Girlfriend Tank is finished. Maizy likes it, which is good enough for me. Super simple to make. I like the way the striping came out, even though I flew by the seat of my pants with it, alternating colors along the way, gradually working toward a higher white-to-blue ratio closer to the top (excluding the straps). Upon being presented with this garment, Maizy asked, “What’s this thing?” in reference to the silver ring on the front bodice. I explained that this was a high-fashion item that would make her shirt more special. Later that day, she followed up with several other questions about high fashion, which I answered confidently, if not in a laughably unqualified manner. A nice air-conditioned stripe, if you will. Once the tank was blocked, the two different yarn types flowed together much more smoothly, as one might expect. 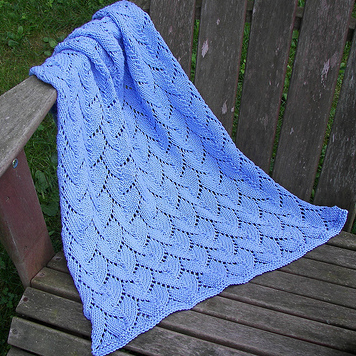 The few rows of solid blue that I’d done at the bottom came out just as I’d hoped; a bit breezy and airy looking, owing to the use of the lighterweight Coquette on its own. Initially I made the straps plenty long, so that I could just shorten them to fit once Maizy could try it on. The problem, as I had figured might arise, was a bit of unwanted boobage on display with the straps anything less than as short as they could be and still fit over her head. I shortened the straps to this short-as-can-be length and it looks much better, but any sudden movements and she’ll be flashing the general public. 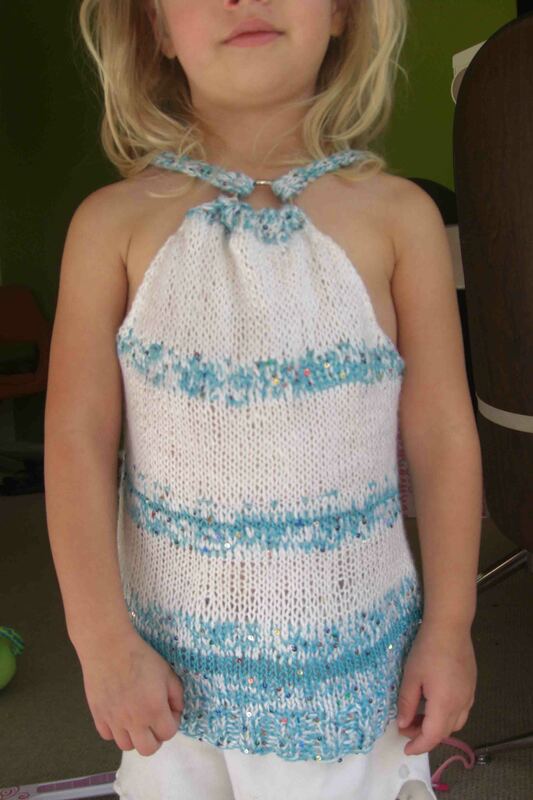 Not that public toddler-boobage is the world’s biggest crime, but since she usually does wear a shirt when she’s out on the town…Sissy B may add a small dart tack (½-inch or so) under each armpit to keep things contained. 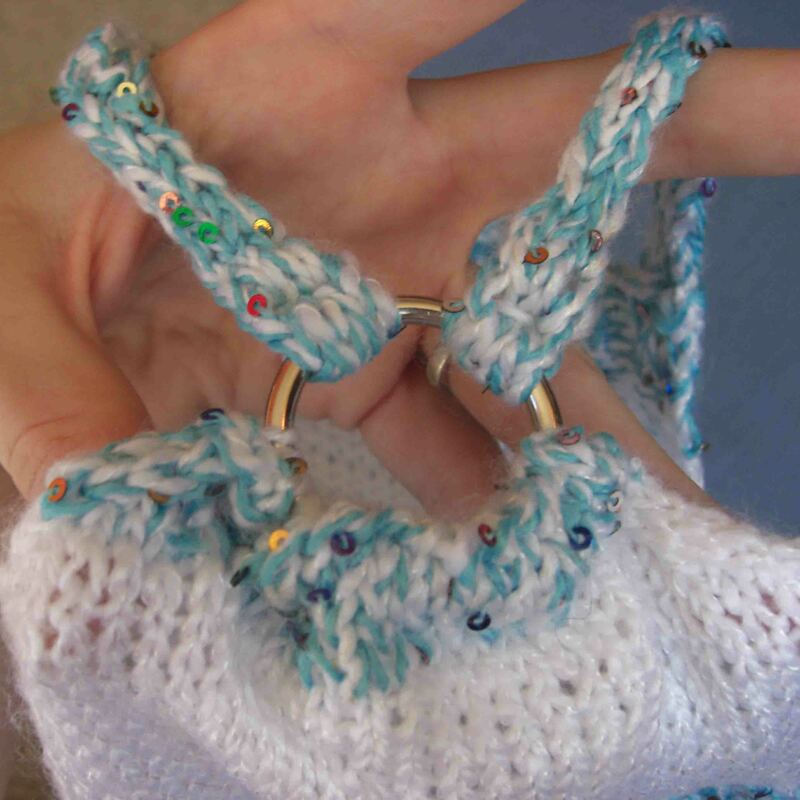 All in all, it’s a cute little project that I hope will be a bit of bling for the wardrobe, even over a turtleneck on snow days. I think she looks fabulous in it, but I’ve got major auntie bias. I did embark on one other wee project recently, inspired by my sister’s a) craftiness and b) environmentally-friendly choices. Months ago we made a trip to Jo-Ann’s during which we picked up some fabric for making cloth napkins. She of course forged ahead with the project, churning out a number of cutie designs that have since replaced her paper napkin supply (she’s also gotten rid of paper towel – even with two little ones – using washcloths and towels to clean up all spills). I on the other hand made no such progress. 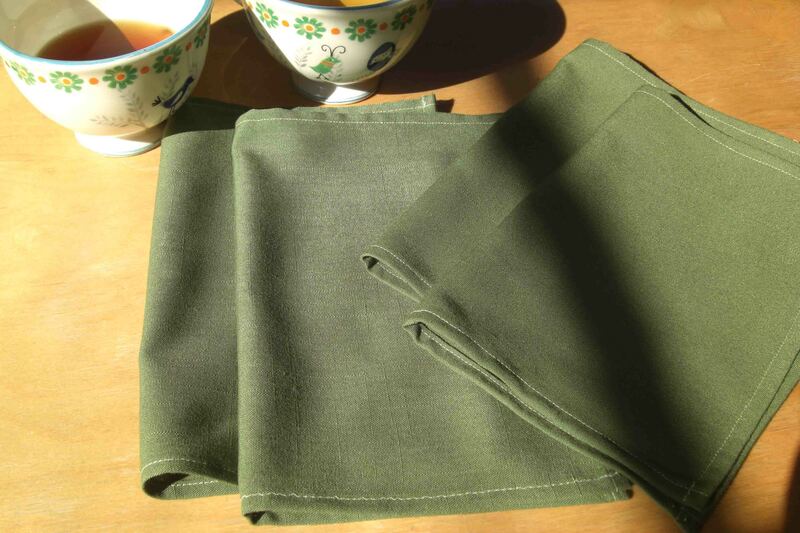 Spurred on by the chance to use my mom’s feisty Bernina (Sissy B now keeps the legendary sewing machine at her place), I got down to it in making a few cloth napkins of my own. That said, sis did end up doing most of the sewing while I was blocking my knitting. But I did some of it. And cut out the pieces and pressed the seams. Not that there’s much of a pattern to these puppies, but we did follow Amy Karol’s Bend the Rules Sewing pattern, because we could, and because we like Amy and her phenomenal blog. I dig these. Not only are they pretty, but I can do my part by decreasing the unneeded consumption of paper products in our household. The Napkins That Saved The World. OK, one parting funny before I sign off. 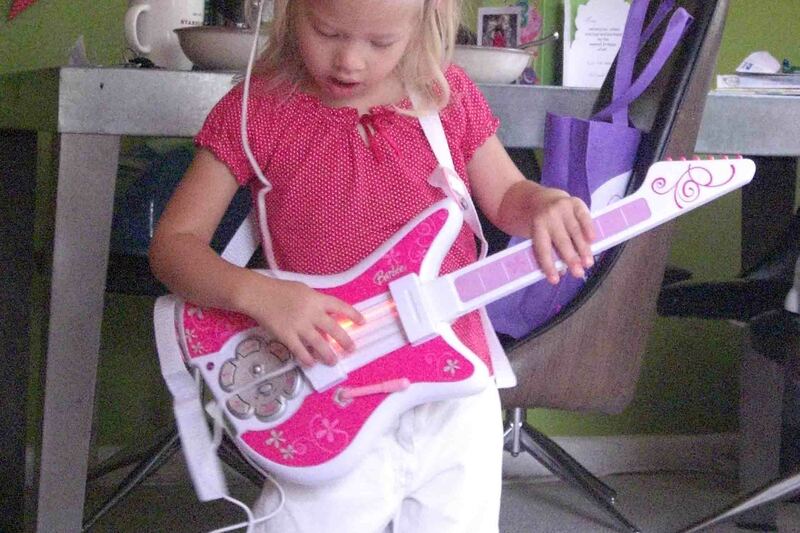 As part of Maizy’s b-day, her parents got her a Barbie Rock Star Guitar. It comes with a headet mike (think Britney) that really works, real strings to strum, and a number of really-not-that-annoying music tracks, which you can speed up or slow down to meet the mood. Anyway, had to share. 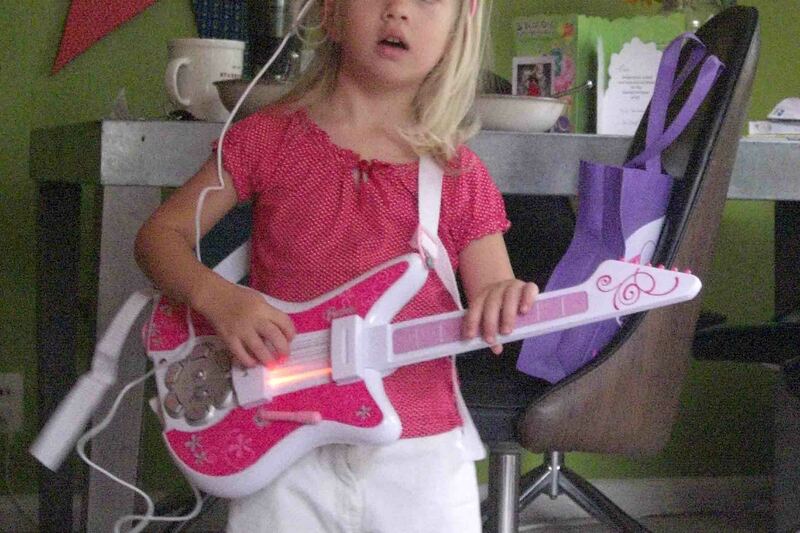 Her leader-of-the-band rocker chick impersonation will forever be linked in my mind with the sparkly Girlfriend Tank that she sported around for us the weekend she turned three. Happy Birthday, Maiz. I’ve cast on something new. My poor second sock and Fisherman’s Sweater sigh collectively in their relegation to the bench. Sorry guys – I got distracted by a couple of balls of yarn in my stash, and I gave in to the ADD. Speaking of. I can’t focus on telling you about my new project until I post a few pics that have recently grabbed my (fleeting, fickle) attention in the way of inspiring future knitting or sewing ventures. Completely cute. I’m such a sucker for cowls, I really really am. I want everything to be available in a cowlneck. So cozy, and so cool-looking. This one is cotton knit, available in the color shown (“terrain”), charcoal, and heather gray. “Cool-looking” is a bit vague (as well as juvenile, but there you go) – let me be more specific. It looks sophisticated, to my eye; the way the fabric gracefully swirls into an artful arrangment, tossing light around, managing to look classy without trying too hard. This Gap version is especially casual-looking with the i-cords and the short sleeves, paired with a striped long-sleeved tee. If I were to knit this, I may want longer sleeves. It’s a fine-gauge knit, which makes it even nicer-looking, but alas, more daunting to knit, which makes it less likely to happen. 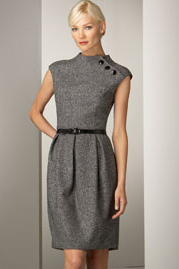 I’m not saying I’m going to run out to the Gap to buy one ($34 isn’t hugely expensive, but…I’d rather get it on sale). However. They do have these available in Tall sizes, which is just so awesome, regardless of the fact that the sleeves aren’t actually long, such as to require a Tall size to make them longer for monkey arms. The long torso would be fully covered, though – no inadvertent belly shots. I feel like I should patronize Gap and Banana Republic more than my once-a-year average so that they keep the Talls in their portfolio. Hmmm. Maybe I need to buy one just for research purposes. In case I get around to making a knock-off of my own, like in 30 years’ time. Hmmmm. All that joyful day-dreaming, just from one glance at a billboard. 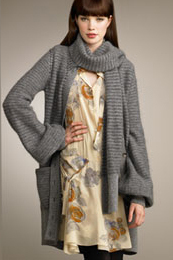 Sweater coat, at Neiman Marcus. Did someone say hoodie? The first one, on the left, looks soooo cozy. You can barely tell it has a hoodie from the front; not that there’s anything wrong with looking like you have a hoodie. What I mean is that it has a very clean, simple look with straight yet soft lines on the front. I like the hoodie-in-the-back part because it keeps the sweater from taking itself too seriously. This kind of feels like a “business in the front, party in the back” cardigan – you know, like a mullet. Except much, much, much less scary. The price tag to obtain this look, however, at least from Neiman Marcus, is a wee bit steeper than a mullet. This was priced at a few hundred bucks…cashmere blend, you see. The price of the sweater coat on the right was approaching two thousand dollars (not in Monopoly money, either). 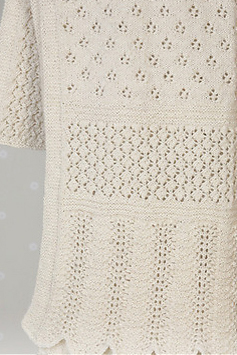 I didn’t bother to take specific note for a wish list of any kind because I’m a normal person and I wouldn’t go spending 2 Gs on a sweater coat, no matter how pretty it is. But since very few of us are actually going to go out and buy it, let’s just skip ahead to talking about how pretty it is indeed, because that part is free. I know what you’re saying: another cowlneck? Well, that’s what I thought at first, hence the initial draw. But the item description said it’s an “attached scarf”, which I can see, upon closer inspection. This too, is knit in cashmere. I don’t care if it’s cashmere or not (although if I had the money to burn – I’ll take the cashmere) – I just really really like the design. In a more durable fiber, this would be a great go-to, wear-it-all-the-time staple. I love the look, and it would be fairly easy to construct something similar on the fly, I think. The last design that caught my eye recently is one would be in the sewing vein. Tell me, is this not the cutest little dress you ever did see? Not so much in a garden-party summer dress kind of way, but more in a polished, I’m-feeling-quite-pulled-together-today kind of way. Now I’m not a size 0, which I’m sure is the size the model is sporting (my booty can only occasionally squeeze into a single-digit size…well, maybe less than occasionally; in theory, I guess it could, like if I quit eating for a couple of weeks), but I think this could be a flattering size on anyone. Almost anyone. The shoulders would have to be a bit broader than average to accomodate my frame, especially with the cap sleeves (which very often on me look like a mistake, perhaps the result of a good shrinking in the dryer). But. If I were to embark on, say, a sewing project (bringing my machine out of the hibernation it’s been in for the last year or so), I could make it to fit. So. The snaps above have been inspiring me as I think about projects on the horizon. Back to the project I’ve cast on. 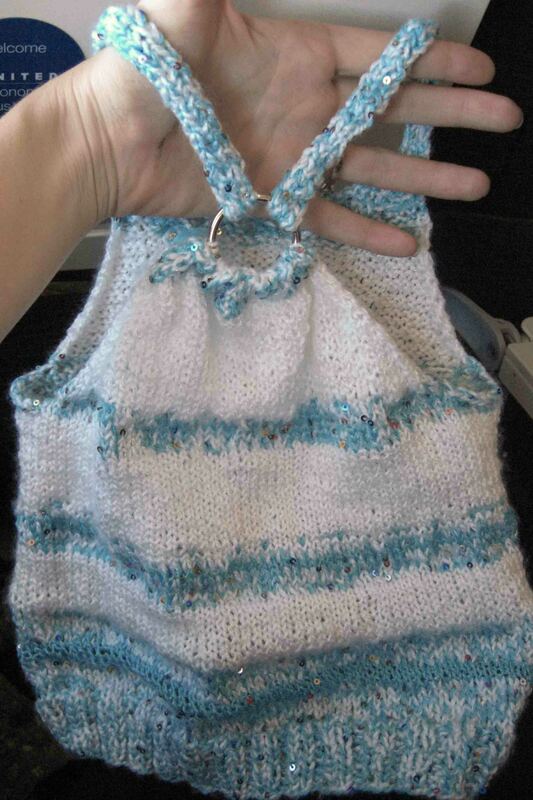 I discovered Wendy Bernard’s website, Knit and Tonic, via MLE’s blog (MLE Knits – love Emily – get it? M-L-E …emmm-elllll-eeeeee). Wendy is the author of recently-released and already very popular Custom Knits, which MLE reviewed here, and I think looks like a great book. It’s now on my Amazon Wish List, where all my dreamy pattern books hang out until I can afford to tell the boys over at Amazon to pick it off the shelf and send it – rescuing it for my exclusive perusal. In other words, she’s hot stuff. 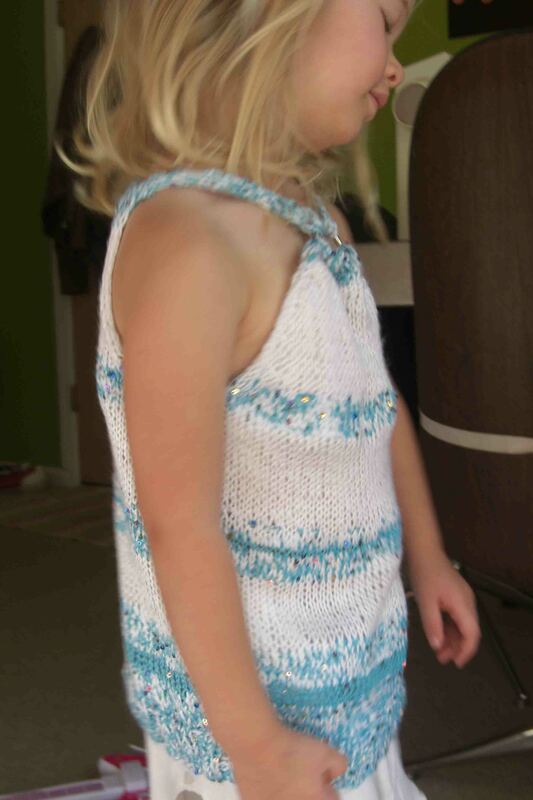 Oh, and did I mention that these knits as featured are of her own design? Yeah, that’s right. She also has a few patterns that are free, which I’ll get to in a minute. Needless to say, her blog is quite popular. There’s a lot to look at. I started with the links under her Photo Album section in the left sidebar, which drew me in with links called The Winners and The Losers: her buckets for categorizing FOs. I discovered the Zephyr gals while stalking visiting Wendy’s site. One look and I knew these two were my kind of chicas. They are the starter-uppers of Zephyr Style, a site through which they offer great original knitting designs (I liked Green Gable, which I’d initially seen on Wendy’s blog). The Zephyr Style blog is located here, just in case, like me, you’d like to lurk for a long, long time get to know them. My heavens, I keep getting distracted. It’s Wendy’s Short Snort Girlfriend Tank, available for free on her Knit and Tonic site. Simple pattern, but fun. Upon seeing it I became inspired to find a loving knit-home for two balls of Louisa Harding Coquette that I’d picked up on clearance a few weeks back. At 73 yards each, this amount wasn’t going to make much, but the wee sparkles were calling my name at the time. Or rather, Maizy’s name, since she is the person I thought would enjoy them the most. I didn’t have quite enough to make the tank completely in Coquette, so I thought perhaps I’d stripe it by mixing in some run-of-the-mill white. I swatched it and liked what I saw. Even if it’d be a bit more work, I decided it would be worth it. The gauge was spot-on with the two fibers held together, and pretty darn close with just the white (standard baby-weight acrylic left over from a previous project – the label is long gone). I decided it would be funky to alternate fairly randomly between white, blue, and both colors combined. 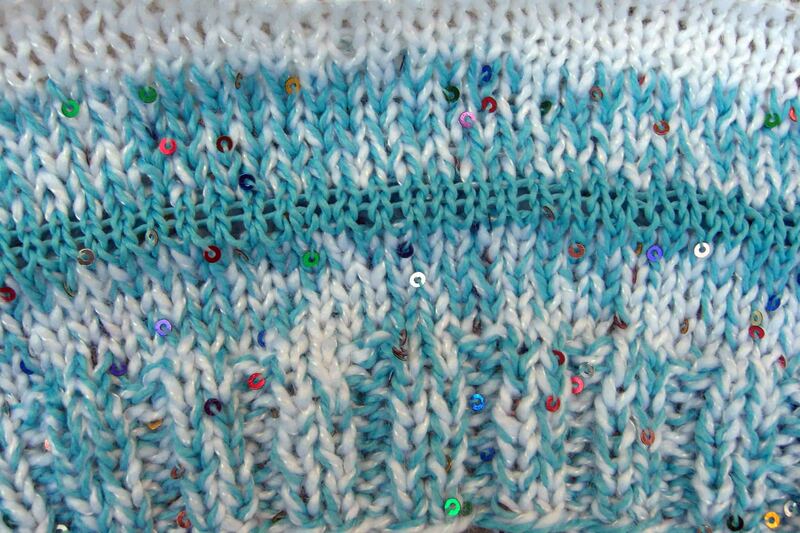 The gauge with the skinny blue-sparkles fiber alone (a.k.a. Coquette) was a little peek-a-boo on my size US 6 needles, but a couple rows here and there seemed to give it a fun texture. Why not? So far so good. I really like it. The project’s not a major commitment at under 250 yds total, but little things can be fun. Plus, they look bigger on a pre-schooler. It may be getting a little cool in Colorado (where Maizy lives) to go around wearing only a tank, but she likes to layer, so she can work this look even through the snowy season. I’d better blog off – time flies. Especially when you spend a good chunk of your evening drooling all over the Anthropologie website (releasing pent-up desire after a brief and fortunately inexpensive trip there with Sissy B while we were together recently). 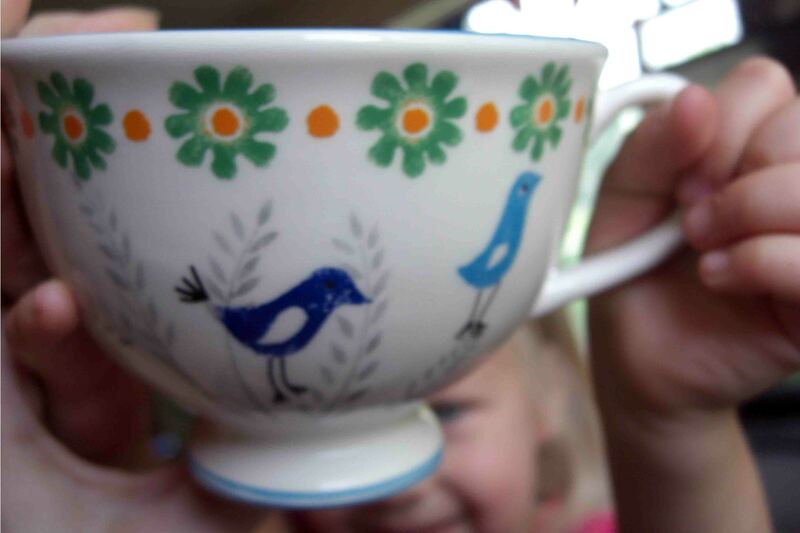 During that trip to Anthropologie, we got two of these mugs (on clearance, of course; my aforementioned pocketbook can’t handle that store on a regular basis, either). The idea was that we could each have a cup, one half of the twin set, from which to sip our tea and think happy thoughts about our visit – later, when we’re miles apart. Then Maizy, who upon fervent request and subsquent cautioning took on the task of carrying the bag with my cup in it, took a bit of a spill as we were walking to the car, bless her heart. She’d been multi-tasking: bag in one hand, my wallet in the other, and my phone – in the locked and off position – anchored in the crook of her neck as she carried on a very serious one-sided conversation with an imaginary version of a family friend. Poor thing. We had boo-boo scrapes on each hand. Cup…was kind enough to break her fall. Not so much in one piece anymore, darn it. Awwwww. No biggie, I said. Sissy B was sad. Really, it’s OK, I said. Small potatoes! Sissy B later went back to the store, unbeknownst to me. She returned with another bag containing another cup, all wrapped up in one piece. When I was a kid we had a humongo garden in the backyard. Nice to have enough of a backyard to do that – easier in the Midwest than in the more populous areas toward which I gravitate now. These days I feel lucky to have a few blades of grass to wiggle my toes in. On the left, our early summer garden, circa 1984. 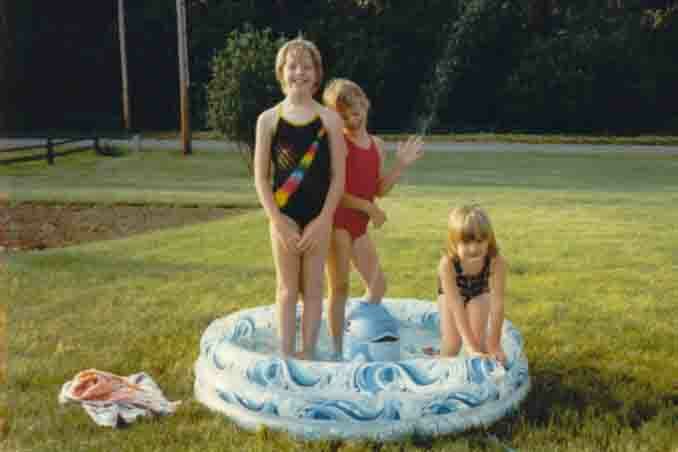 In the middle, my sisters and I, definitely not weeding. That backyard garden was so awesome, but at the time I took it for granted, because, of course, that’s what kids do. Memories of our garden conjure up the smell of fresh cut grass, since Dad would usually whip out the tiller to work in the garden after he’d mowed the lawn. This usually ended up being later in the day (since the lawn got cut first), so I have visions of the sky shifting to dusky hues as Dad made the rounds with the tiller, shirtless skin completely sun-burned. Always he was donning the tried-and-true cut-off jean shorts he wore for pretty much the entire summer (except to work, duh). No protective gear, though. Nah! Unearthed rocks flying into eyes, detaching retinas – no biggie. Tiller. Tiller. It’s a funny word when you think about it too much. Tiller. As I was typing above I got all nostalgic about the old tiller. It was red. I think it was a Toro (not that I know anything about tiller brands, I swear; this name just popped into my head). 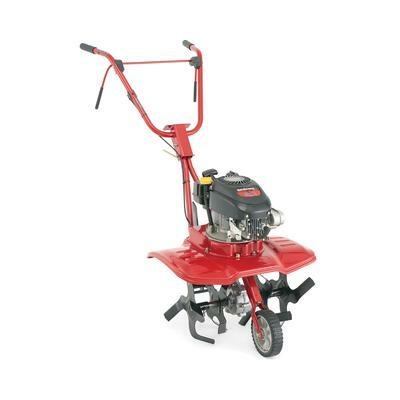 I went so far as to Google “old garden tiller” to find something that looked similar to what I remember. What I found is a bunch of new-fangled ones that are a lot shinier and less dangerous-looking than what I remembered. But I was small at the time, so everything looked big. Apparently as a tot I used to run around in the garden behind Dad in the parts he’d already tilled, singing my little no-one-will-hear-me-because-the-motor-is-so-loud song of, “Runnin’ in der dirt, runnin’ in der dirt”. I don’t remember this, but I do remember my imaginary friends, Peach and Rake, who I had with me all the time at that age. Hey, my sisters hadn’t been born yet – I needed some company. Now I can appreciate how wonderful it was to enjoy those fresh-picked, still sun-warmed fruits of my parents’ labor (heaven forbid I should help out in the garden – ever – no, the credit goes entirely to them). Corn, tomatoes, carrots, potatoes, beets, melons, cucumbers, squash, cabbage, beans, radishes, onions. A couple of years we did pumpkins. Early on my mom had sunflowers growing along the back edge, too. But as I grew up, schedules got busier and the crops got scaled down, understandably. Tomatoes and beans were pretty much it by the time I was in high school. Nonetheless – how cool is that? Now I’m gagging for a garden and I’ve got no space. Serves me right for grumbling about weeding in my adolescence. But I dream about becoming a proper green thumb – I know it’s a lot of work, but I feel like I’d be up for it. If I only had the land. Sigh. In the mean time, I stick to the farmer’s market. There’s a great one nearby on weekends, and this morning, upon realizing we were fresh out of fruit, Bidie and I headed over there and loaded up. This is the perfect time in the season to get good deals on things that are still growing in abundance: veggies – yes, tomatoes (I looove the heirlooms) – and, oh la la, fruits. Peaches and nectarines of every variety imaginable, with samples that knock you out with flavor. We’re exploring the pluot recently, since more versions of them keep popping up to try (pluots, I discovered, are a hybrid of three-quarters plum, one-quarter apricot). Apples for two bucks a pound, mix and match – so many kinds to pick from with names I’d never heard of – all of which I wanted very much to crunch. And strawberries. Oh, the strawberries! I found myself drooling for at least a minute after I tasted the first one. We bought a whole bagful. All of this was organic. It all tastes so much more alive than what I’ve been eating for, well, years. Each taste makes you feel like a kid, probably because that was how long ago it was before the mealy, chalky taste of produce predominantly grown from GMO seeds drowned the market. Long live real food – I’m rooting for the comeback of the underdog. Anyhoo. 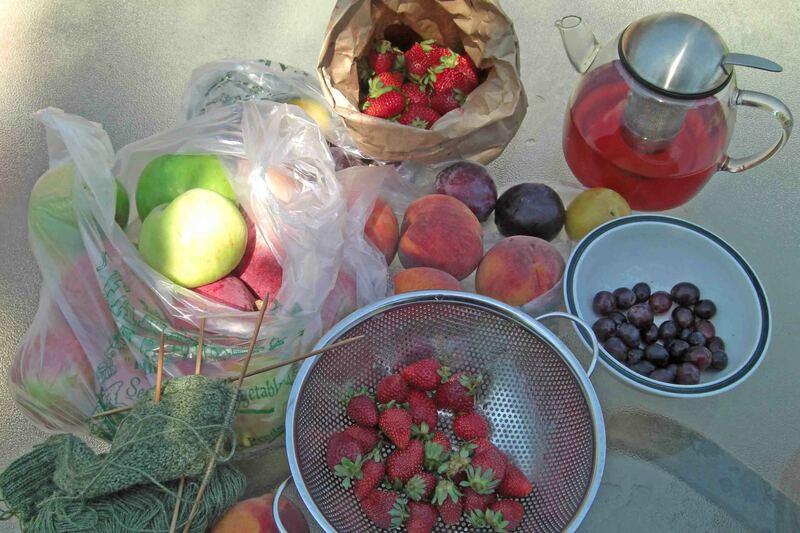 We came home and had a picnic of fruit. Got out the chilled tea, rolled up the sleeves, and got down to business. As you can see, my knitting is in the foreground, waiting to be pounced upon after I get the fruit down my gob. By the by, isn’t this a great little tea pot? 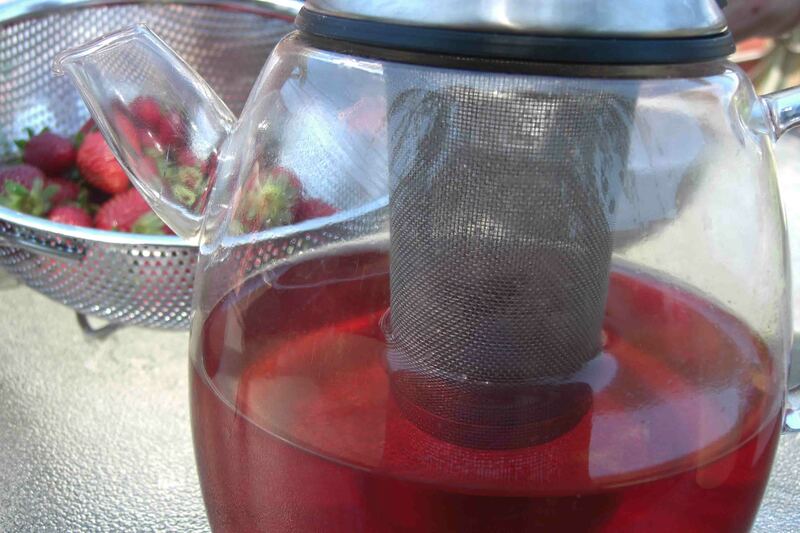 Put the tea in the steel strainer in the middle (for me, this is two bags), pour in the boiling water, and voila – it steeps for a few minutes while becoming an elegant centerpiece with which to top up your cup (the lower part of the strainer ends before the bottom of the pot so that the last inch or two of tea doesn’t get over-steeped if it sits there for a while). It comes with a little brushed chrome stand with a tealight holder to keep the tea candle-warmed. I think the reason it looks so cool is because it’s European – they do make everything cooler-looking over there. This was a housewarming gift from my sibling-ishly close friends Kymber and J. Incidentally, these are the parents of Little J, plus the bun-in-the-oven/to-be recipient of my not-yet-knit baby blanket (the design for which you are helping me choose). Right. So on the knitting front, I’m rounding the heel flap on the second Braided Cable & Broken Seed sock. That’s a fancy way of saying I’m still about halfway done with this sock, which is where I was at the time of my last post – busted. Want to do my knitting for fall, including continuing with the Fisherman’s Sweater, but it’s still too stinkin’ hot here to do it. I know I shouldn’t complain about the weather in California, but the fall air should be smelling a bit more like college football by now, according to my Midwestern roots. I’ve been out here for five years, but I miss my seasons no less than that first fall. Boo-hoo, I live in California, where the sun shines too much. OK, I’ll stop. This is my happy spot for the afternoon, a seat with a few blades of grass around it, a laptop with an internet connection (sad, but I get nervous without it in reach), my knitting, some yarn to daydream about, and my reading. 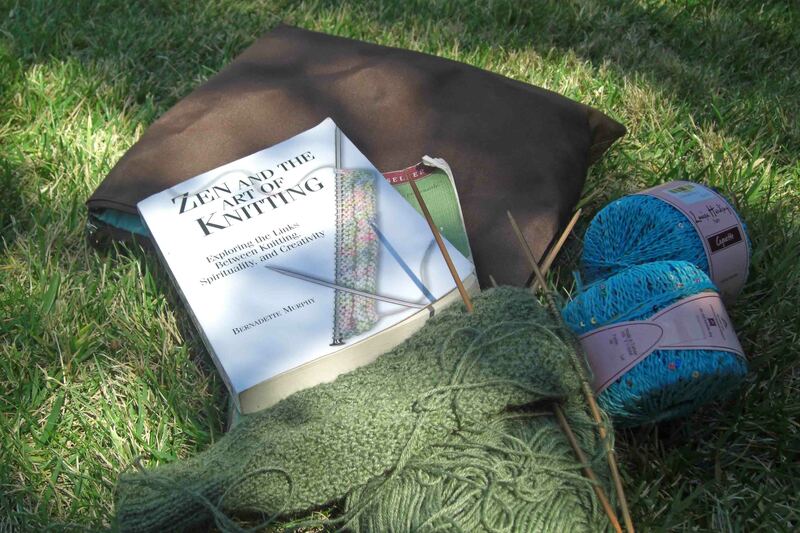 Shocker, the reading is also knitting-related: Zen And The Art of Knitting, by Bernadette Murphy. I’ve only read the first bit, but already I feel a pleasant kinship with the author. Will report back when I’ve finished it, if I can manage, at some point, to put my knitting down long enough to give the book a chance to be read. Speaking of pleasant kinship and books, Allison and her mates at On My Bookshelf are having a book giveaway – check it out! Allison’s knit/superwoman blog, The Whole Ball of Yarn(s), is a good friend, and was the source of my learning about the book blog. Allison reviewed a few Jane Austen-related books this week (including Confessions of a Jane Austen Addict, which I own but haven’t read yet) – I was beyond delighted. Hooray for Jane! OK. Back to my happy spot, my knitting, and my chilled tea. I like it a lot. Oh, joy – a Monday without work. At least work work, the kind that involves a commute. Mostly I’ve had a down-low kind of weekend, and I’ve managed to milk it by keeping the lethargy theme steady throughout today. This weekend I’ve alternated time between knitting (halfway done with that second sock), looking at knitting patterns, and being cozy with family. 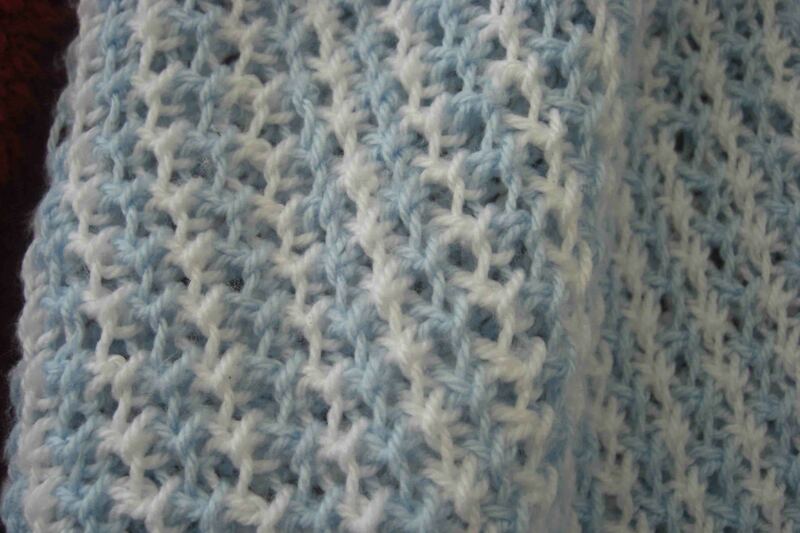 The knitting patterns I focused on yesterday were of the baby blanket variety. One of my closest friends is due with her second baby late this year, and although I don’t know if the baby is a little he or a little she, I figure it’s time to get poised with at least a pattern, if not the yarn and/or a decision to go with a happy unisex color or colors. I’ve made a couple of baby blankets, the second and more successful of which I posted about here. The first one, while very nice to the touch and just lovely when folded, was a little challenged in the way of symmetry. Aha! I've come back to haunt you from 10th grade geometry. It came out trapezoidal. That is, in the shape of a trapezoid. 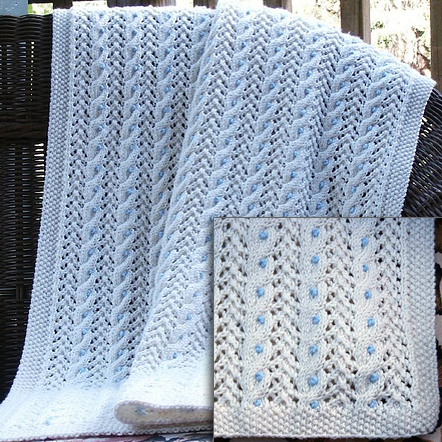 I had decided to knit the Favorite Blue/White Blanket, a Bernat pattern available for free. 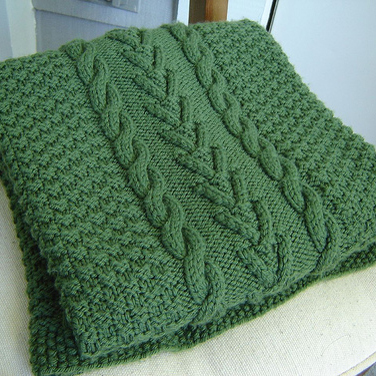 This was the third or fourth knitting project I’d ever attempted – the first blanket, and the first thing not to be made on fairly big needles with a fairly bulky fiber. 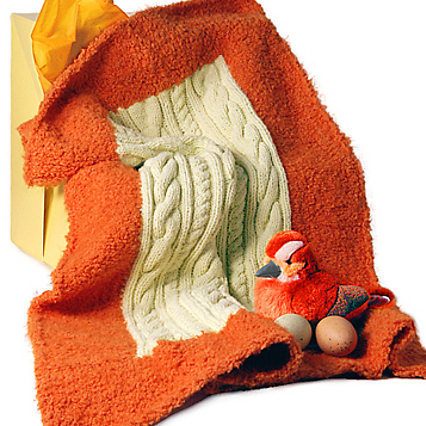 It was certainly my first baby item, and I was very nervous about the delicateness of it all. 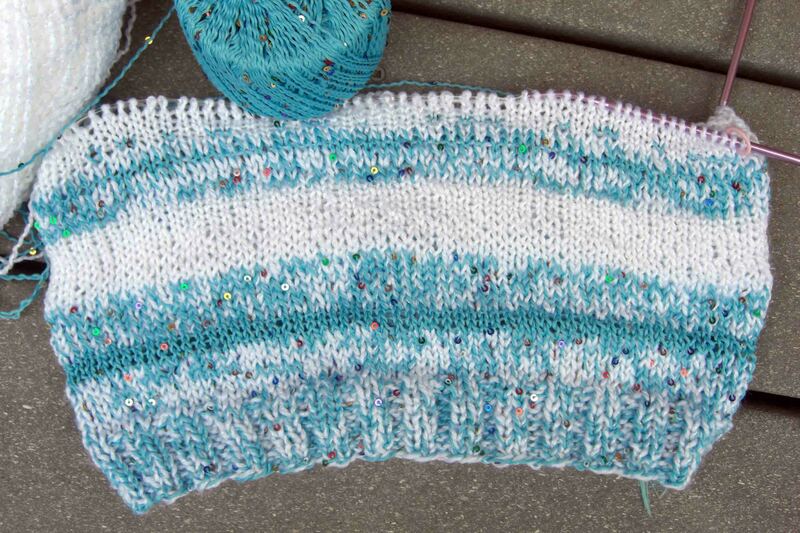 The US 7 and US 8 needles to be used seemed teensy weensy to me, and as much as I was determined to make a go of this pattern, I found that the notion of casting on more than 60 stitches made me sweat a little. I decided not to tempt fate in altering the recommended yarn (it didn’t occur to me then that gauge isn’t quite as important for a blanket as it is for a sweater). 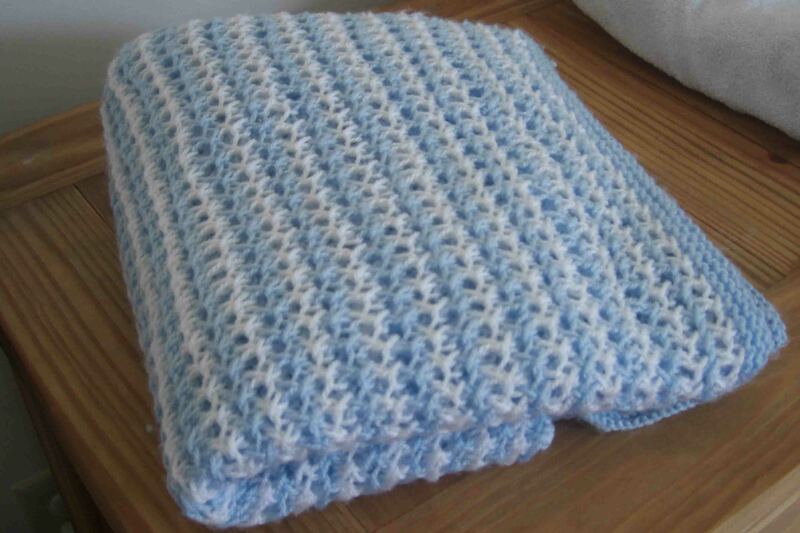 I used Baby Softee as instructed, in, you guessed it, blue and white. 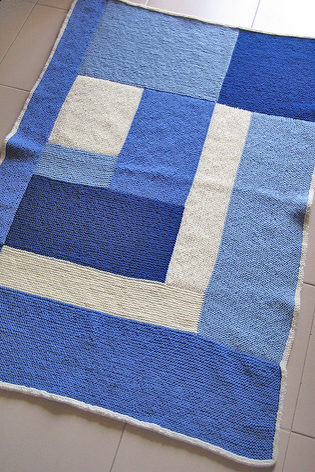 It seemed to me if the pattern is called Favorite Blue/White Blanket, better not to mess with Texas. Blue and white it was. Good thing the baby in question was a boy. 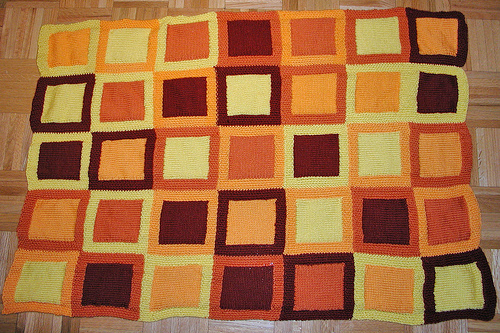 The trapezoid FO was the obvious result of nerve-induced too-tight tension on the starting end of the blanket. 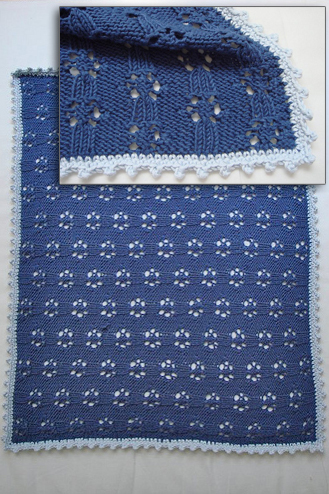 The stitch was actually very pretty – nice texture, yielding a lightweight fabric that wasn’t too lacy or fussy – but it took me days to get through the first couple of rows. This wasn’t because the stitch was difficult, but because I was inadvertently pulling each stitch so tightly that none of them would slide down the needle without a lot of elbow grease. An obvious fix, you say (duh, stop pulling them so tight), but I just thought that these were the inevitable and wily ways of working with smaller needles. With progress, my stitches gradually yet increasingly relaxed. By the end of the blanket, my stitches were loosey-goosey, happily flying off the needles. Didn’t really dawn on me until it was done that it was a leetle off from a rectangle. Even blocking couldn’t bring it back into shape – but oh well, it was done, and the myriad of stitches I’d made were ready to embrace that little newborn, no matter how asthetically imperfect the collective whole of the stitches might have been. I packed the blanket up and sent it off with love to the adorable Q and his mom, who is one and the same Kimlee I visited in Richmond recently. 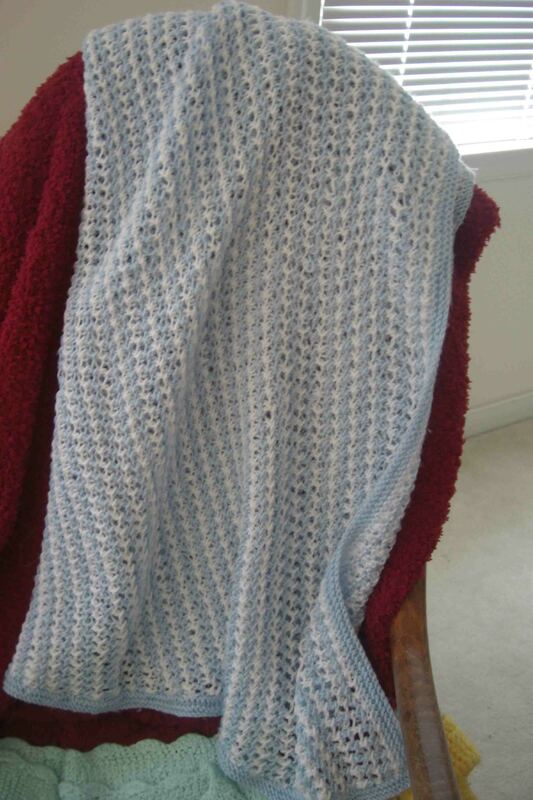 She was very gracious about the trapezoidal nature of the blanket, and made me feel good about the uniqueness of my humble handicraft. It made my heart sing when, during my recent visit, I noticed the Blue/White Trapezoid draped across the rocking chair in the nursery. I took a few surreptitious snaps while everyone was downstairs, and brushed away a little tear of joy at the sweetness of finding it there. I know, I’m a sap. So. Now I’m looking at patterns for the next blanket up to face the vice-like grip of my needles. Below are my finalists. Colors may depend on baby gender…or maybe not. Suggestions welcome on color or fiber, but it’s the pattern that I need to settle on first. Help me choose! Just click on each pic for a closer look. ..The Whole Ball of Yarn(s)..